Use your iPad or iPhone to study on the go during your break. One of the questions we receive here at StudyOrgo frequently is how to get ahead for the next semester. Arguably, the second semester of organic chemistry is much more challenging for students than the first. This is because all of the general chemistry refresher and organic chemistry introductory material has been covered and you are now responsible for it! You may have covered addition reactions, maybe substitution and elimination if your professor was on task. But that covers the reactivity of only 3 of the more than 20 functional groups you will study in this class! Thus, the speed of the course is about to pick up. We have developed a few helpful hints to take advantage of your winter break and get ready for the spring semester of organic chemistry. Open your text book – Shockingly simple, often overlooked. Simply read the title and abstract on the first page of each chapter and check out the number of pages. It will give you a very quick idea of what you will be learning about in each chapter and how much material you will be covering. Look at a syllabus – Organic Chemistry II is often a continuation of Organic Chemistry I and likely you will have the same professor or pool of professors from the first semester. Remember, your syllabus is an official contract between you and the professor. They must disclose what you are required to learn and how you will be graded. Professors can remove requirements at will but cannot add them easily. Use this to your advantage! Highlight the contents or reactions of the book that will be required and use this to focus your attention on while studying over the semester. Schedule your studying NOW! – Now that you know where the book is and a rough idea of what you are responsible for learning from the syllabus, take a calendar and divide the time you have to each test by the number of chapters. Schedule 2-3 hours a week to study and DON’T SKIP OR RESCHEDULE. Think of it as a doctor or dentist appointment – you just have to do it! Also, if you plan your studying ahead, you will be less likely to schedule something that gets in the way because you will already have penciled it in! Use your Smartphone calendar to send you alerts and reminders for your studying appointment. Read ahead – If you have a week or two left, read at least two chapters over the break once through to get yourself ahead of the class. Don’t try to understand everything, just pay attention to the words used and the ideas. This will allow you to pay more attention and ask questions about the details in class instead of scrambling to write down notes and drawings. 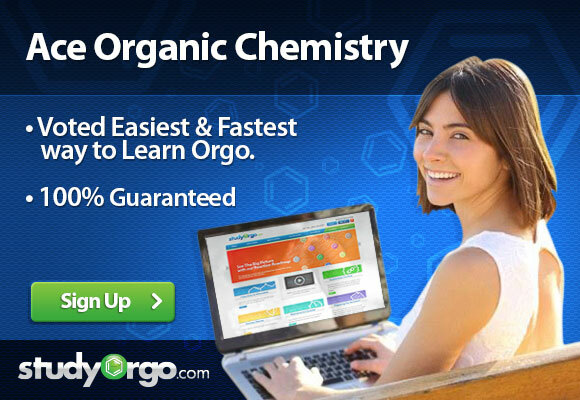 With a little time management and StudyOrgo, you will have no trouble getting an A in Organic Chemistry this year!